Kiva is the world’s first person-to-person micro-lending website. 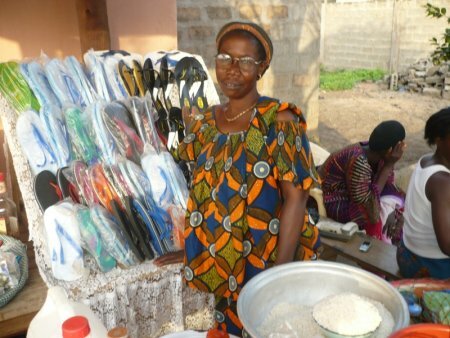 Their goal is to help eliminate poverty by giving small non-profit loans ( starting as little as $25) to entrepreneurs in developing countries.These entrepreneurs usually can’t go to a bank for a loan because they don’t have enough money to make a deposit or have any collateral for the loan. But it’s not just the size of the loans that’s different. What’s really unique is how this system makes lending personal. You know who you’re lending to and why they want the money — and you will get periodic updates on their business or project, along with the status of repayment. This is one gift that keeps on giving– the ultimate recycling. Once the loan is paid off, the money goes back into the givers bank account and they can re-gift their money to another entrepreneur. Plus you’ll be teaching your child how to care about others instead of themselves, as well as how to research, use math skills, decision making, etc. Ms. Djabo Tezi ASSAO (in pic above) is 50 years old and the mother of a family of four. Her work involves selling shoes and common consumables. She started this business in 1998 and gets her supplies from the Agoè marketplace. Currently, her stock of grocery items is almost exhausted, and she would like to renew the stock by buying 3 sacks of rice, 4 boxes of sugar, 2 drums of oil, and 2 boxes of spaghetti.